‘The Scottsboro Boys’: good grief, is this the best our theatre can do on the subject of race? Let me get this much out of the way: The Scottsboro Boys is hugely entertaining, beautifully staged, delightfully choreographed, superbly acted, well designed, funny, moving, and graced with a wonderful score by the storied team of Kander & Ebb. It also has the inestimable treat of a star turn by the beloved Hal Linden. Alright, publicists, there are your quotes. Use ’em if you like. But in doing so, you’d be playing a sleight of hand with the import of the critical review which follows. That would be exactly the sort of chicanery played (unwittingly, I think) by the creators of The Scottsboro Boys. The musical sets out to expose a racist past, tell a hidden story and celebrate with dignity a group of innocent teenagers caught in the machinery of the 1930s system of southern (in)justice. But in the end, it celebrates modern race relations as if all our problems are gone with the wind, and we can all get along, and it makes of the great Rosa Parks a figure of minstrelsy. Yes, the story of The Scottsboro Boys is told (and told well) but in the service of what larger narrative? That, nowadays, everything has changed and, in spite of this sad and dismal past, we can all celebrate together the post racial era of the 21st century. The play does not seem to recognize this problem and thus does not transcend minstrelsy. It is essentially promoting the big lie of equality and the transcendence of racism in American life and in doing so it is itself a kind of minstrel show. One of the essential lies of the minstrel tradition was the presentation of “happy darkies”. Given the appalling segregation of contemporary theatre audiences and the relative absence of any significant Black theatrical voice in the mainstream of the theatre world, The Scottsboro Boys strikes a disturbing note. Even though it is a fine musical, thought provoking and entertaining, it leaves me wondering why this? When there is an absence of serious work among the best funded commercial and non-profit companies addressing contemporary Black experience, and an almost nonexistent Black audience for the theatre, why a musical featuring Black actors tapdancing in a minstrel show? 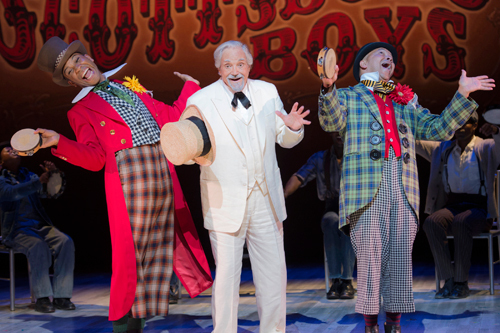 The Interlocutor (Hal Linden, center) with Mr. Bones (Jared Joseph, left) and Mr. Tambo (JC Montgomery) in The Scottsboro Boys, playing June 21–July 15 at the American Conservatory Theater. Photo Credit: Kevin Berne. I would love to leave these questions aside and simply enjoy an entertaining evening. It seems unfair to hold the creators and producers of The Scottsboro Boys responsible for these matters. But if theatre claims artistic relevancy beyond casual entertainment (and, certainly, ACT purports to make such claims), then we critics must be willing to bring up these difficulties. A Black colleague of mine, a playwright himself, has made this observation: an unintegrated theatre in America today (whether we’re talking about theatre makers, producers or audiences) can be assumed to have something significantly wrong artistically. And a production that purports to address racial issues, especially in such a controversial manner, invites challenge as to its effectiveness and appropriateness in moving to solve this problem. The bottom line for me in reviewing The Scottsboro Boys is that all these implications and concerns make it virtually impossible for me to experience this production on its own terms and in isolation. With so much urgent need to truly integrate our theatre and address contemporary racial concerns, it is the wrong approach at the wrong time. I acknowledge The Scottsboro Boys to be well made entertainment presented by an impressively talented company. But my confusion and distaste with the implications detailed above leave me unable to fully endorse this production. The above was difficult to write. I would like to acknowledge my friend and colleague Nick Mwaluko for his insight and assistance. The Scottsboro Boys continues at ACT through July 22. For further information click here. “The Scottsboro Boys” with music and lyrics by John Kander & Fred Ebb, book by David Thompson, produced by A.C.T. in association with The Old Globe. Director and Choreography: Susan Stroman. Associate Director and Choreographer: Jeff Wright. Set Design: Beowulf Boritt. Costume Design: Toni-Leslie James. Lighting Design: Ken Billington. Sound Design: Jon Weston. Music Director: Eric Ebbenga. The Interlocutor: Hal Linden. Mr. Bones: Jared Joseph. Mr. Tambo: JC Montgomery. The Lady: C. Kelly Wright. Olen Montgomery: David Bazemore. Willie Roberson: Cornelius Bethea. Eugene Williams: Nile Bullock. Andy Wright: Christopher James Culberson. Haywood Patterson: Clifton Duncan. Clarence Norris: Eric Jackson. Ozie Powell: James T. Lane. Charles Weems: Clifton Oliver. Roy Wright: Clinton Roane. Posted in Reviews.Tagged A.C.T., Beowulf Boritt, C. Kelly Wright, Christopher James Culberson, Clifton Duncan, Clifton Oliver, Clinton Roane, Cornelius Bethea, David Bazemore, David Thompson, Eric Ebbenga, Eric Jackson, Fred Ebb, Hal Linden, Jaes T. Lane, Jared Joseph, JC Montgomery, Jeff Wright, John Kander, Jon Weston, Kander & Ebb, Ken Billington, Nile Bullock, Rosa Parks, Susan Stroman, The Old Globe, The Scottsboro Boys, Toni-Leslie James.